UMOCA's Out Loud program gives the experiences of queer youth an artistic voice. For gay youth in Utah, culture and religion can conspire to make them feel isolated and unable to express their true selves. At the Utah Museum of Contemporary Art, several young local artists are getting that chance. The exhibition Out Loud: Mostly Human marks the fourth annual culmination of a multi-week program giving LGBTQ youth opportunities to work with mentors and develop their unique works of art. According to UMOCA's curator of public engagement, Elly Baldwin, Out Loud combines their personal passion for serving the LGBTQ community with a need to create an outreach program for teens. 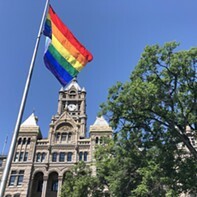 Of course, making potential participants aware that such a program even exists can be a challenge in Utah, which has made a partnership with the Utah Pride Center particularly valuable. "It was really difficult to go into schools, or to have teachers distribute the information, just based on district policies and the values and beliefs of teachers," Baldwin says. "So being able to hand out fliers and talk with youth at the center was helpful. And since the first year, word-of-mouth from students has been really great." Beginning in late November and early December, UMOCA opened up a short application process for 9th-12th graders, with applications due at the end of January. That process, however, has thus far been only a formality, as no student who has applied has ever been turned away. The program then begins in February, featuring sessions that involve getting to know the individual artists and their creative goals, introducing them to working queer artists in the community, exploring different mediums and artistic concepts, and ultimately brainstorming topics for the participants' final projects, with the goal of creating a piece for the exhibition. Those submissions—from 14 student participants in 2018—represent a range of creative work, from paintings and ink drawings to pottery and mixed media. Some of the works explicitly address the experience of being queer, yet that's not a result of the program emphasizing such a focus. "In the workshops that we do in the program," Baldwin says, "we help to demonstrate that we can explore lots of different aspects of the self. ... While we're exploring identity, and we're here as a supportive community for queer young people, we talk about the artwork in a way that it doesn't have to focus on one part of who you are. And even if you do choose to focus on that one thing, there are so many other things that go into and inform that work as well." 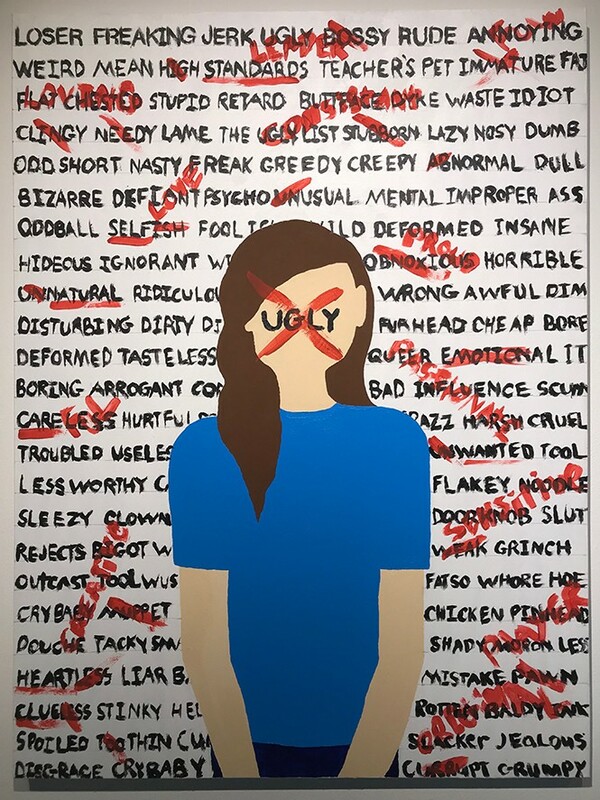 It can be a tricky matter for an LGBTQ teen to present art at a public exhibition, and Baldwin notes that artists have always been informed that they can identify themselves to the level of their comfort, whether that means using a pseudonym or just initials. Yet for 2018, Baldwin observes, every one of the artists chose to use their own full names. "That's one of the most incredible and impactful parts of the experience for me," Baldwin says, "is seeing, in so many different ways, how the program can encourage those moments of young people wanting to advocate for themselves." The growth of the program and its impact on the participants can also be seen in those who have "aged out" of being able to participate in Out Loud as artists, yet still wanted to be part of the process. For the first time in 2018, former Out Loud artists—four 2017 high school graduates—became part of the process of putting the exhibition itself together in the UMOCA space, including giving the exhibition its name and deciding on the organization of the works within the exhibition space. "I wanted to approach it as a learning opportunity for them," Baldwin says, "where they could meet with our curator and preparator here, learn from them what goes into putting together UMOCA exhibitions. We had a few sessions where we talked about how art can be organized within a space, how you write about someone else's art in a way that helps to frame it or open it up to a viewer. ... I mostly tried to ask questions, talk about examples of how things had been done elsewhere in the museum, then have them take their own direction with where they wanted to take the show." That participation yielded compelling results, including leading off the exhibition with Bri Slaughter's mixed-media piece Rebirth, featuring a figure on a door that serves as an entry point into the other works. For both the first-time curators and the participating artists, Out Loud is an opportunity for full and open acknowledgement of their whole selves, at an age where that might not always be possible. "We offer a space where queer youth can explore their creative selves and build community," Baldwin says, "and try to lift some of those controls that adults often place on youth, and what they're supposed to say or think. As much as possible, this is their show, and their experience."